Ok, not all of them, just a subset of them. We’ll get to that in a minute. First, a little background. developUs builds training, lots of it! And we love it. There’s nothing like creating a solution from the ground up, for an organization that values development. There are two parts of the process that I am particularly fond of – the analysis and the final product. When we engage with a client to complete an analysis, we look at everything from the learner’s preferences, to the behavioral objective required to achieve organizational objectives. But the place that we spend more time than any other is around culture. Our mission is to take a 30k foot organizational strategy and land it squarely in the learner’s zip code. To do that successfully, we have to unpack the corporate culture. Now, there are several ways to go about understanding company culture, but there’s one tool that I use on a consistent basis because it generates such great conversation, and leads to a better understanding of how their leaders lead. On a piece of paper, draw four boxes. Label the left side “RESULTS” and the bottom “BEHAVIORS,” and then fill in the boxes, so it looks like this. Results indicate achievement of goals (all of your employees have them, right? ), and behaviors indicate the way that people go about achieving those goals. You could think of it as the WHAT and the HOW of each individual’s job. Now it’s time to think about what you as a leader do with each of these types of people. Let’s start with the HIGH results, HIGH behaviors. These are the team members who are knocking it out of the park and doing it by the book. They are crushing their sales goal, increasing their margins AND using the CRM you rolled out last quarter. They are the top performers that you wish you could replicate. What do you do with these people? The answer is easy, you REWARD and RETAIN them. No brainer. LOW results and LOW behavior. These members of the team refuse to play nicely in the sandbox AND don’t hit goals. Many years ago I had a boss tell me that there were two things you can’t change in a person, mean and lazy. If they are mean and lazy, that’s enough for a call to action. Stop the virus and as the adage says, hire slow and fire fast. There’s nothing that hurts my head more than a leader who tells me that a person resigning was “not a significant loss.” If that’s the case, you should have fixed the problem long ago. Lead them out, don’t wait for them to go in their own due time. It could be the wrong job, or the wrong company, or the wrong boss (Yup – I said it), or they could just be plain ole mean and lazy. It’s the last two categories that say a lot about the corporate culture. Let’s start with LOW results and HIGH behaviors. They might be hitting their weekly call volume goals, using the CRM well, and playing nicely in the sandbox with the rest of the team, but they are not producing results. What do you do with this group of people? How you answer the LOW results and HIGH behaviors question tells me as a training developer whether leaders value training, believe people can learn, invest in development, and most likely whether they are going to be committed participants in the development process. 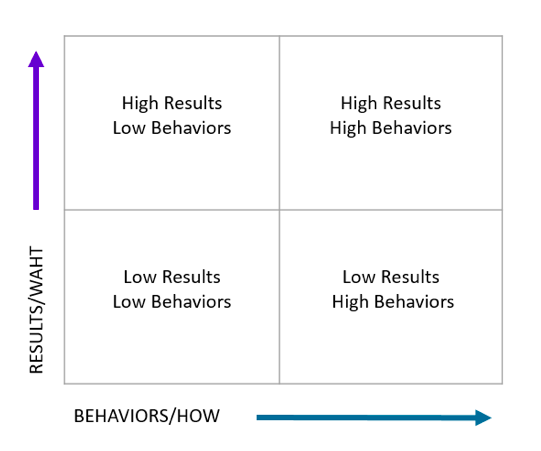 The LOW/HIGH box tells us a lot, but how a leader responds to the HIGH performers who have LOW behaviors tell us even more. What do you do with the sales person that is your top performer regarding revenue, but your worst performer in terms of teamwork? Every good change management practitioner will tell you this, “There will come a time when trying to improve the performance of your team, that you will have to make a tough decision. There will most likely need to be a sacrificial cow.” And in case no one else has told you this, the way in which you handle top performers who don’t play nicely in the sandbox says more about your leadership style. So, what are you going to do about it? Whatever you do, stop publically rewarding them immediately! Revenue or reputation? Cash or credibility? Sometimes you can’t have both, but no matter what you have to take care of it. Use these four culture questions to guide your thoughts around performance results. What are you doing to reward and retain the people who are achieving in both the results and behaviors category? Who on your team needs to be “made available to the marketplace” because they are failing to meet your expectations in both the results and behaviors categories? How are you developing skills that drive results for the people that get it (the HOW) but haven’t figured out the WHAT yet? What are you willing to do to eliminate the top performers that leave carnage in their wake? developUs has created an experiential 2-day course to increase accountability by establishing performance expectations that promote a high-performance culture and align to your organization’s goals. Learn more about attending or bringing D.R.I.P. leadership to your organization.